Confusion around cryptocurrency regulations is omnipresent. U.S. regulators attempt to fit digital assets into their existing frameworks, personalities in the traditional financial world offer mixed comments and often adopt the narrative “Blockchain not Bitcoin,” and leaders in the cryptocurrency community look to conciliate their ideals with the need to work with regulators. This abundance of information coming and going in various directions has created a climate of confusion. For all actors involved, the stakes are high. Assuming that digital assets are not going away and have potential to add tremendous value, regulators are looking to protect the public, not hinder innovation. To this end, it is important for them to stay close to progress and maintain control over it. That being said, even if new regulations were to be implemented in this space, there is no timeframe. For the cryptocurrency community — whether one is a speculator, maximalist, opportunist, entrepreneur, or user — growing the ecosystem benefits everyone. Going against regulators while ignoring rules and recommendations is unlikely to yield any positive outcome. With this constant noise around cryptocurrency regulations, it is easy to lose track of the existing solution: The safest and most conservative approach is issuing a security using one of the exemptions of the JOBS (Jumpstart our Business Startups) Act. These rules were established to help small businesses raise capital and could provide token issuers with a solution for the time being.Before exploring these exemptions further, we will provide some background on the state of regulations. The CFTC views Bitcoin as a commodity, the IRS defines cryptocurrency as property, and the SEC indicated that many ICOs were security. Commodity (utility) vs Security, why does it matter? A trading platform providing a spot market on commodities or currencies does need to be licensed while a platform offering securities (including security tokens) are required to register as a national exchange or Alternative Trading System (ATS), and as a broker-dealer. In addition, security token issuers are subject to other constraints which we will discuss later in this post. These limitations are time-consuming, intrusive, and expensive, which explains why the cryptocurrency community is resistant to the SEC qualifying cryptocurrencies and ICO tokens as securities. Yet, as we will see later, issuing a security is not as constraining as it seems.Finally, businesses involved with financial assets are required to comply with financial services and consumer protection laws including the Bank Secrecy Act and the USA Patriot Act. In July 2017, the SEC published a report presenting the DAO token (Decentralized Autonomous Organization) as a security. To reach this conclusion, regulators showed that the token fulfilled ALL four factors of the Howey Test — a test designed by the Supreme Court in SEC vs W. J. Howey Co to determine whether a transaction qualifies as an investment contract, which is a form of security. In June 2018, the SEC Commission Director of Corporate Finance, William Hinman, announced that based on the level of decentralization of the Ethereum network, the commission would not classify offers and sales of Ether as security transactions. Why did these announcements matter? They provided clarity to companies looking to do an ICO, and they gave hope to utility token advocates. When issuing a token through an ICO, the safest approach is to assume that the token is a security. As such, issuers should ensure that the offering complies with applicable securities laws. Tokens’ status could be fluid. A token can be issued as a security and “transform” over time into something else. While there is no guarantee, the SEC’s announcement on the status of Ether opens the door to tokens fulfilling a utility on the platform of the issuing company even though they were initially issued as securities. Security issuers must register securities with the SEC unless they qualify for an exemption. In 2012, the JOBS (Jumpstart Our Business Startups) Act was passed to help small businesses raise capital without going through the time- and resources-consuming Initial Public Offering (IPO) process. In short, the JOBS Act amended the Security Act of 1933 to ease securities regulations and encourage funding of small businesses. This resulted in the creation or modifications of -among other things- some exemptions. The JOBS Act was not tailored to ICOs specifically (they were not around then), but it seems to fit the needs of security token issuers. Preemption: Some of the SEC exemptions discussed below “preempt” state securities laws. Typically, if a company is selling securities, it must comply with both federal regulations , and state securities laws and regulations in the states where securities are offered and sold (states where investors and offerees are based). If an offering exemption is preempted, the security is not required to be registered with state regulators and comply with the “blue sky” laws. Back to our exemptions. Within Reg D, issuers have three distinct rules at their disposal: Rule 506 (b), Rule 506 (c), and Rule 504. 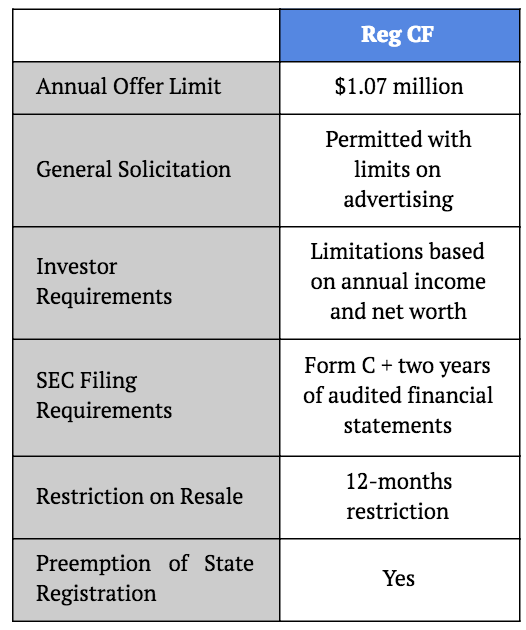 These rules differ in 1) The offering limit amount per year, 2) The ability to use general solicitation, and 3) Investor requirements. Rule 506(b) and Rule 506(c) appear better suited for companies looking to raise a larger pool of capital across the U.S. Both rules have no limit on capital raise and preempt state registrations. However, issuers are only allowed to raise capital from accredited investors (to be considered an accredited investor, one must have a net worth of at least $1,000,000, excluding the value of one’s primary residence, or have income at least $200,000 each year for the last two years and have the expectation to make the same amount this year). 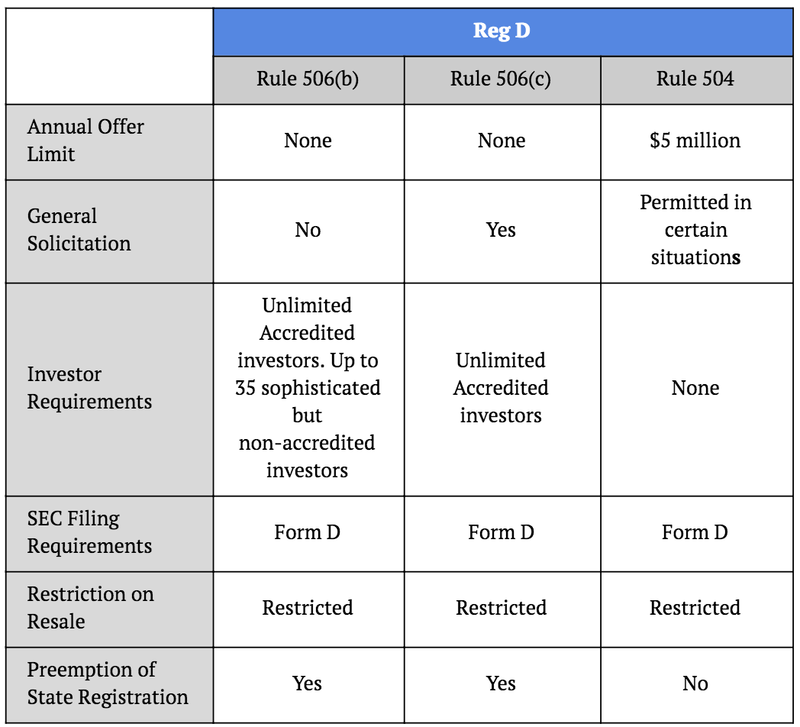 Rule 504 does not have restrictions on investor status. However, issuers are limited to $5 million of capital raise and are required to register the security with state regulators. We could see Rule 504 as more interesting for local businesses looking to raise capital locally, within a community. All three options have resale restrictions and thus are likely to yield less liquid tokens. Reg A+ is another widely explored option. Introduced by the SEC in 2015, it differs from Reg D in its capital raise limits, restrictions on resale, and qualification requirements. Reg A+ seems appropriate for businesses looking to raise under $50 million and looking to solicit non-accredited investors. Given the restriction to provide two years of financial statements, we could assume that Reg A+ would be a better match for established startups. In contrast to Reg D, securities issued under Reg A+ do not have restriction on resale, which should result in more liquid markets. Reg CF provides a simple and straightforward option for the issuer but it is limited to a small amount of capital ($1.07 million or less). Reg D and Reg A+ provide the opportunity to raise significant amounts of capital. However, they each have drawbacks. 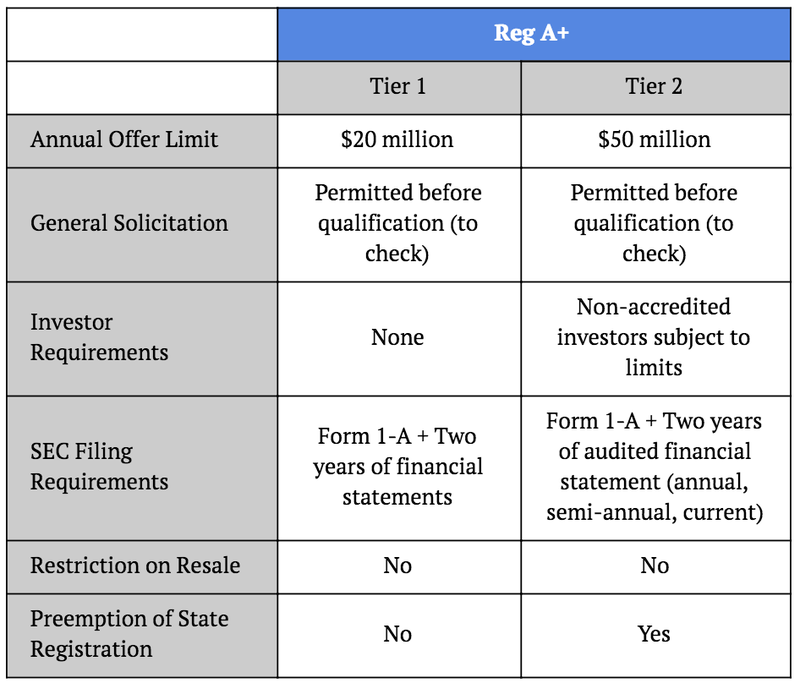 Under Reg A+, issuers must qualify their offering with the SEC before selling the token. According to recent data, only 55% of offering statements filed qualified. Furthermore, the response time from the SEC appears to be at least 2–3 months. By contrast, issuers filing under Reg D do not have to qualify their offering, but the sale of tokens is only available for accredited investors and the resale of token is restricted. The no resale restriction for Reg A+ issuers could make sense for issuers who need the token to fulfill a certain utility role on the platform while issuers under Reg D could issue a token with a more traditional equity role. The major drawback for tokens using exemptions limited to institutional investors is the requirements to limit sale and resale to accredited investors. This both limits the potential audience and requires the issuer to continuously verify that tokens are not resold to non-accredited investors. While solutions have been constructed to help token issuers, there is no standard in place. Despite the outcry against the lack of clarity and regulations in the U.S., we would argue that the existing framework is relatively solid and clear. Issuers should start by considering whether their token passes the Howey Test. The most likely scenario is that the token is a security and thus should be registered with the SEC or qualify for an exemption. While the exemptions have trade-offs, they were put in place to help small businesses raise capital. It is possible that regulations dedicated to ICOs and cryptocurrencies will be implemented over time. But for now, token issuers have to use the existing tools and should not bet on regulations being modified.As of this writing, an issuer can raise unlimited amounts of capital through institutional investors and have resale restrictions OR raise up to $50 million with all investors without resale restrictions OR limited amounts of capital with little restrictions. Even for projects looking to issue a utility token, the token could start as a security, and as the platform decentralizes and the token fails the Howey Test, it could turn into a utility and become available for resale to the public.